Are we losing touch with our humanity? Yes, contends Alan Wolfe in this provocative critique of modern American intellectual life. From ecology, sociobiology, and artificial intelligence to post-modernism and the social sciences, Wolfe examines the antihumanism underlying many contemporary academic trends. Animal rights theorists and "ecological extremists" too often downplay human capacities. Computers are smarter than we are and will soon replace us as the laws of evolution continue to unfold. Even the humanities, held in sway by imported theories that are explicitly antihumanistic in intention, have little place for human beings. 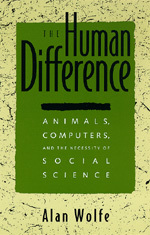 Against this backdrop, Wolfe calls for a return to a moral and humanistic social science, one in which the qualities that distinguish us as a species are given full play. Tracing the development of modern social theory, Wolfe explores the human-centered critical thinking of eighteenth- and nineteenth-century scholars, now eclipsed by post-modern and scientistic theorizing. In the work of Durkheim, Marx, Weber, and Mead, human beings are placed on the center stage, shaping and interpreting the world around them. Sociology in particular emerged as a distinct science because the species it presumed to understand was distinct as well. Recent intellectual trends, in contrast, allow little room for the human difference. Sociobiology underlines the importance of genetics and mathematically governed evolutionary rules while downplaying the unique cognitive abilities of humans. Artificial intelligence heralds the potential superiority of computers to the human mind. Post-modern theorizing focuses on the interpretation of texts in self-referential modes, rejecting humanism in any form. And mainstream social science, using positivist paradigms of human behavior based on the natural sciences, develops narrow and arid models of social life. Wolfe eloquently makes a case for a new commitment to humanistic social science based on a realistic and creative engagement with modern society. A reconstituted social science, acknowledging our ability to interpret the world, will thrive on a recognition of human difference. Nurturing a precious humanism, social science can celebrate and further refine our unique capacity to create morality and meaning for ourselves. Alan Wolfe is Professor Emeritus of Political Science at Boston College.